Part of a special rainbow collection, these seaside pets seem destined to become best friends! 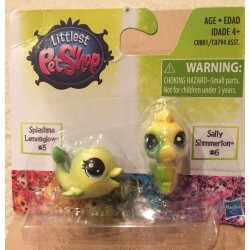 Imagine that this dolphin (Splashina Lemonglow #5) and seahorse (Salty Shimmerton #6) bonded over their shared sparkly deco, in dazzling shades of lime green. A colorful way to start -- or add to -- any LPS collection! Includes 2 Mini scale pets.